Aluminum bullet housings with a Chrome or Gloss Black anodized finish. Built with ProBEAM® Amber/White Dynamic Ringz™ behind a DOT and SAE compliant smoked lens. The outer ring of 24 white ProBEAM® LEDs showcase a smooth white halo that functions as the running light while 12 center amber LEDs function as the turn signal. When a turn signal is activated the White LEDs turn completely off for the entire turn signal cycle providing greater visibility to the amber turn signal. Complete ProBEAM® turn signal units are a direct plug and play, bolt on Front Turn Signal replacement for the OEM turn signal housing on all 2014-2019 indian® Chief® and Springfield™ models. Units measure 3.125" Long x 2.25" Diameter. No additional modules required. Lifetime Warranty against LED failure. Sold Pair. 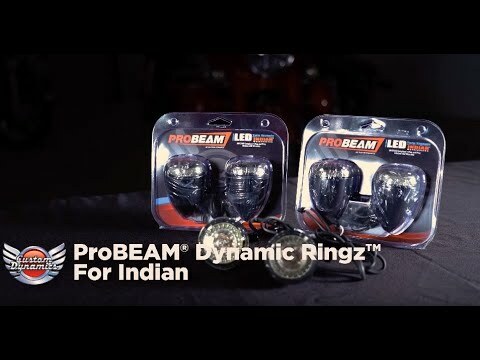 Front turn signals can also be replaced with our Solid Amber ProBEAM® Turn Signals for Indian®, while solid Red ProBEAM® Turn Signals are available for the rear. Plug and play Front Turn Signal replacement on all 2014-2019 Indian® Chief® and Springfield™ models. Front turn signals can also be replaced with our Solid Amber ProBEAM® Turn Signal for Indian® while solid Red ProBEAM® Turn Signals are available for the rear.